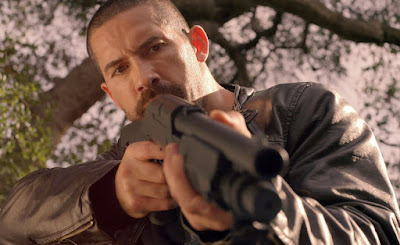 Thank goodness for Isaac Florentine and Scott Adkins. They are two of the last pillars holding up the concept of DTV action movies. Where would we be without them? Close Range is an entertaining and streamlined outing and another feather in their already well-plumed caps. While wags may complain that the plot is thin and the dialogue lacking, we would put it in a different light: nothing is overly complex and there is plenty of room for the main attraction, which are the action scenes. So many times there are overly-complex dramatic motivations and fat when there doesn’t need to be any. Close Range dispenses with most of this and gives the fans what they want: thrilling and well-choreographed fight and action scenes. The whole movie opens with a bang and there’s plenty more where that came from. Fan favorite Adkins more than makes up for the lackluster El Gringo (2012), with this follow-up south-of-the-border tale. Shootouts, car chases, and fights ensue, but as we always say, we’re more fans of Martial Arts skill than gunplay, and of course there’s plenty of that too. In this post-The Raid (2011) and The Raid 2 (2014) world, not to mention Ong-Bak (2003) or The Protector (2005), fight scenes have become more “open”, and Florentine has taken this cue. Even the fact that the majority of the action takes place in one house is reminiscent of The Raid, as is the fact that the baddies get harder to beat as MacReady goes along. These are all good developments, by the way. Hopefully Florentine and/or Adkins will take these themes and run with them in the future. It’s all very well-lit and we loved the fact that you could see everything clearly. The Adkins fight scenes are the undoubted highlight here, and they don’t disappoint. In the 70’s, bad guys looked for “the ledger”, in the 80’s/90’s they looked for “the disc” and now in the present they look for “the flash drive”. 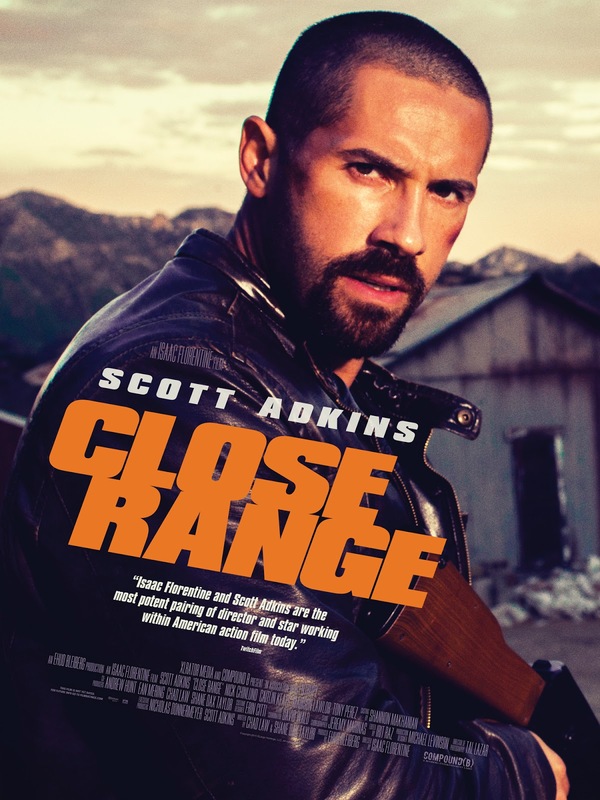 In this way, Close Range is very much in the tradition of B-action movies of yore, and the Sergio Leone touches only serve to reinforce the pleasantly retro vibe. For unpretentious, audience-pleasing fun, look no further than Close Range. A swordsman from the future named Mason, who has attained the rank of “Dragon Warrior” (Chapin) travels back in time to the year 1999 to find a cure for a plague-ravaged world after the big earthquake kills most of civilization. While you might think that if it was invented in the past, they would have the serum in the future, you’d be wrong. So Mason and his partner Regina (Jason) end up having to fight a bunch of people, but the main baddie is Fullock (Storm). There’s also an emperor-like overlord named Vestor (Lynch), but his presence raises more questions than answers. Will Mason and Regina run for the cure? Will future populations be saved? Dragon Fury had us asking the question, “where’s Joe Estevez?” It really seems like he should’ve been involved, but he’s nowhere in sight. Lack of Estevezness aside, this ‘Fury is junky, no-budget sludge that is essentially a cross between Future War (1997), Abraxas (1990), Peacemaker (1990), and a parent’s video of a child’s school play. It makes sense that Troma released this, because the way it’s filmed will make your eyes hurt, and it will likely annoy you. What doesn’t make sense is that the normally-dependable David Heavener directed it. It all, somehow, feels very un-Heavener-like. Maybe he was preoccupied with his one-scene “special guest appearance” where he plays against type as a nerd. Unsurprisingly, he was probably unsatisfied working on the production, which would explain why he didn’t return for the (inexplicable) sequel. Robert Chapin did, however. Chapin, last seen in Comeuppance Classic Ring of Steel (1994), takes a step down here with this far more amateurish production. His lovely, lovely locks are still in abundance and they put the hair of most of the female characters to shame. While he’s not the only mulleted guy to be seen, his is truly king of them all. Perhaps that’s why he graduated to be lead Dragon Warrior. TJ Storm makes a worthy villain, and Richard Lynch is…here, but the movie is loaded with stupid, stupid stupidity that will make you feel stupid. Probably the highlights are the Skid Row fight and the Chinatown fight, and if you ever wanted to know what having a lobotomy might feel like without having to go through the time and expense of undergoing the surgery, watching these two scenes is likely the closest you’ll get. There are irritating characters such as Milton (Loch), as well as some hooded ninjas, and a lot of silliness, and it’s a pretty unapologetic Terminator (1984) knockoff, but the good side is that it’s only 79 minutes. So at least it has the good sense not to waste too much of your time. It’s a prime candidate for the MST3K treatment (either by they themselves or you with your friends). Dragon Fury will make you yearn for the presence of Jorgo Ognenovski. And that’s saying something. Also check write-ups from our buddies: Bleeding Skull and Fist Of B-List! John Cutter (Snipes) is an airline security specialist. An expert in his field, he knows all the proper procedures should there be a terrorism incident on board an airplane. It just so happens Cutter is going to get to put his expertise to the test when he finds himself on a flight to L.A. with arch-terrorist and super-evil bad guy Charles Rane (Payne). Rane has a team of co-conspirators working with him, and he’s taken everyone on the plane hostage. He thinks he’s in control of the situation, but he didn’t count on one thing: Cutter, of course! With the death of his beloved wife still haunting his mind, Cutter also feels especially responsible for protecting stewardess Marti Slayton (Datcher). While Cutter has compatriots on the ground such as Sly Delvecchio (Sizemore), Rane has quality baddie-ess support in the form of Sabrina Ritchie (Hurley). What follows is a battle of wits and fists as Cutter takes on the so-called “Rane of Terror”. Rane thinks he’s going to pull off his crime, and he just might, except for the presence of…PASSENGER 57. (Which is Snipes, not the little boy named Norman, just so we’re clear). As roulette instructional videos go, Passenger 57 comes up aces. Hey, don’t tell us we can’t mix some metaphors around here. 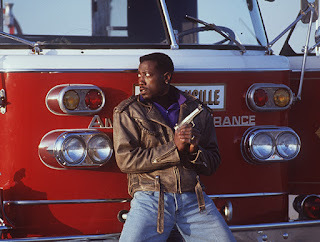 It’s “Snipes on a Plane” as a young and dynamic Wesley entertains us all with everything an action hero should have: witty one-liners and snappy dialogue, an ability to get out of sticky situations, and some quality Snipes-Fu. That’s right, all action heroes should engage in Snipes-Fu. Especially when it’s mano-a-mano combat with Bruce Payne-Fu. Importantly, these are two of the main ingredients that make Passenger 57 work: a strong hero and a central, nefarious baddie. You’d be surprised how often action movie-makers leave out these seemingly-essential ingredients. Thankfully, they’re present and accounted for here, and it’s all wrapped up in a classic-90’s framework. 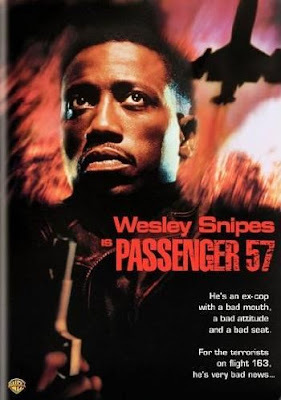 At 80 minutes, Passenger 57 is everything you want and very little of what you don’t. We applaud director Kevin Hooks and the writers – more movies should be 80 minutes. You can pack in plenty of great stuff, and P-57 is certainly never boring. The soundtrack is poppin’ bass and/or smooth jazz by turns, which you would expect when Stanley Clarke is providing the music. The opening credits montage is an assemblage of various objects, including cassette tapes, and there’s almost non-stop product placement for Pepsi. Rane has a classic “evil nerd” in his motley crew of evildoers, and, as you might expect, John Cutter is called “the best” at what he does. Transportation-based action was hot in the 90’s, as evidenced by this, Speed (1994), and…others. Interestingly, Speed was released the same year as Drop Zone (1994), a movie in which they decided to push Wesley Snipes out of the plane. Apparently the Hollywood suits wanted to see what would happen. Co-star Alex Datcher was no stranger to action at this point in her career; we remember her from Rage and Honor (1992) – also notable as the same year as P-57 - and Jeff Speakman classic (?) The Expert (1995). It was also nice to see Liz Hurley in an atypical role, and fan-favorite Tom Sizemore is on board (the movie, not the plane) as Sly. It has been said he was named Sly because Stallone was originally supposed to play the Cutter role. Maybe John Cutter is related to Chuck Norris. This lame joke will make more sense if you click on the link. Also noteworthy, we think, is the usage of the name Charles Rane for the baddie. Fans of the great classic Rolling Thunder (1977) should remember that that is the name of William Devane’s character, as exemplified in the memorable tagline, “Major Charles Rane is coming home to war!” – presumably the writers were aware of this? Well, apparently not. We’re just big Rolling Thunder fans, that’s all. P-57 may even have some nostalgic value to you if you remember seeing it at your local video store. Because it’s fast-paced and fun, we feel it has aged quite well. 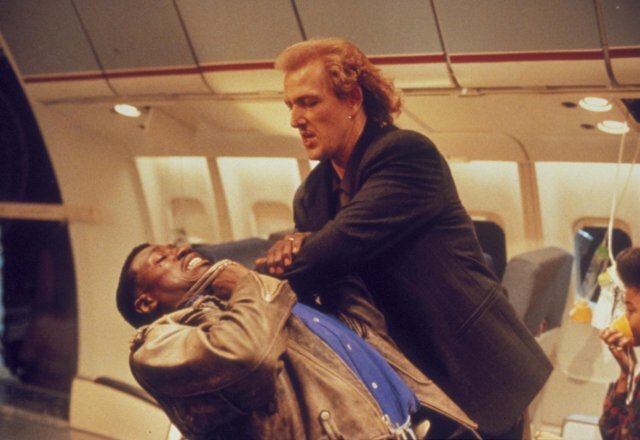 If you’re looking for classic 90’s action in a nutshell, watch Passenger 57. Set primarily in Yugoslavia during World War II, Bridge to Hell is the story of Lt. Bill Rogers (Forest), a U.S. Air Force pilot who was shot down and escaped from a POW camp, and his compatriots Sgt. Mario Espozi (Mucari), and Blinz (Valente), a former German soldier who deserted and decided to join the good guys. Along their perilous travels to reach the allies in Italy, they end up teaming up with a small band of Partisans, including Vanya (Ferre). What ensues are a bunch of battles between our heroes and the Nazis, and not much else. There’s also a subplot about “St. Basil’s treasure”, and how to find it and what to do with it. Will our heroes finally reach the BRIDGE TO HELL, and if so, why would they want to cross it? 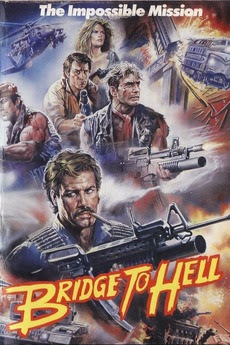 Bridge to Hell is a rather staid World War II actioner. It’s not a bad movie per se, but it’s run-of-the-mill and certainly not Lenzi’s finest hour. Lenzi was doing a lot of movies like this in the final third of his career, and nothing about Bridge to Hell stands out in any way. His prior movie, The Wild Team (1985), is very similar, but instead of being set during WWII, it’s an exploding-hutter in the jungle. The main problem is that it’s all very samey – rural locations, various different missions that involve shooting, blowing up planes, blowing up trains, blowing up bridges, and stock footage of all of the above. Instead of just a bunch of random Nazis, there should have been one super-evil Nazi bad guy. As we’ve seen countless times before, when there’s no strong, central villain, the movie suffers, and Bridge to Hell is no exception. Not that all the aforementioned shooting-and-blow-up missions are all bad – there’s a very cool train explosion, and it was nice to see our heroes dropping bombs on the baddies by hand from out of a biplane – but some more meat on the bone as it relates to character development, suspense, or surprises would have been nice. Also in the win column are pre-political correctness bits of dialogue such as the above quote and the fact that Rogers consistently calls his Italian buddy “Spaghetti”. That’s his nickname for him, and not only does Espozi not care, it perhaps makes the bond between the two men even stronger. Okay, we might be reading into that just a tad bit too much, but we really hate political correctness. Also, they were in the midst of a war zone, so there were no “safe spaces” to run to. Literally. For the 1989 U.S. VHS release on Cannon, they had their current star, Michael Dudikoff, do an intro to the movie, as they did for other titles in the “Action Adventure Theater” series. This intro is not included on the Inglorious Bastards 2: Hell Heroes DVD collection where Bridge to Hell can currently be found. The VHS tracking lines did find their way into the collection, however. In the end, Bridge to Hell is good-natured but dull, and not exactly a must-see. Also check out a write-up by our friend, The Video Vacuum!